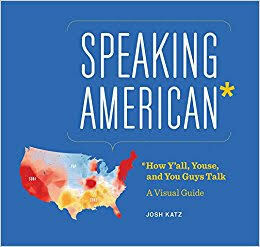 This book is the result of the interactive dialect quiz posted on the New York Times website in 2013 (you can take the quiz HERE) which identifies regional dialect differences. When it comes to identifying common objects like that fizzy stuff that comes in cans (pop, soda, coke, or cocola, depending where you drink it), what we say when somebody else sneezes (73% of Americans say "bless you", except those who live in the Deep South), or the pronunciation of the word "crayons" (there are four acceptable forms), it's difficult to believe we're all talking the same language. I was pleased to note that we do all agree on one thing: pancakes are pancakes, even in Hawaii. Who knew? If you ever need to know, I'm a "potato bug, semi truck, crawfish, drinking fountain, kitty-corner" person. Don't figure that you'll be able to read just a few pages of this book. It's quick and engaging, and un-put-downable! Recommended for ages 8 to adult, fun to share.